Pictured from left to right: MEMA Executive Director Russ Strickland, Nextdoor Senior City Strategist and Professional Neighbor Joseph Porcelli, MEMA Digital Engagement Coordinator Emily Allen, and Nextdoor Member Claire Corcoran. REISTERSTOWN, Md. 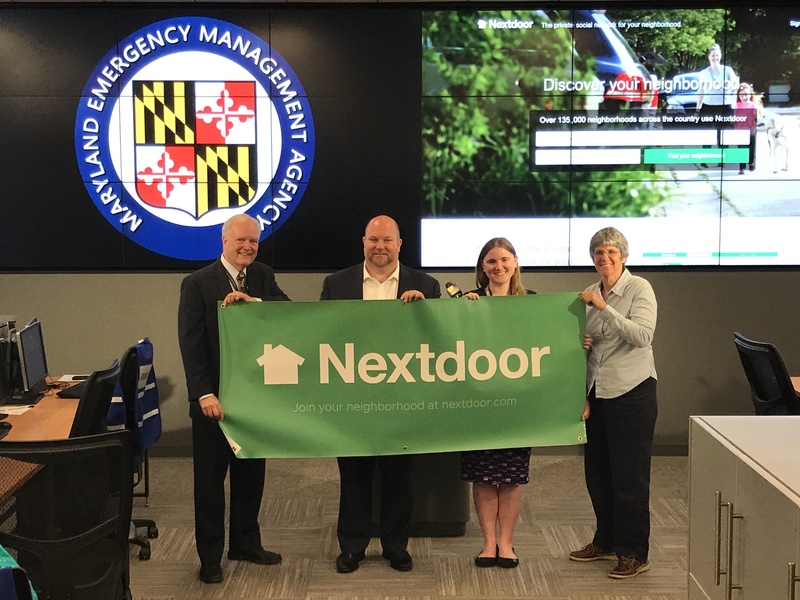 (April 20, 2017) — Earlier today, the Maryland Emergency Management Agency (MEMA) announced a partnership with Nextdoor (nextdoor.com), the private social network for neighborhoods, to improve statewide and neighbor-to-neighbor communications before, during, and after emergencies. MEMA will use Nextdoor to connect with neighbors by sharing news and updates and providing preparedness and alert information directly to communities. MEMA and Nextdoor neighborhoods will be able to work together to increase resiliency across Maryland. To date, Nextdoor has proven to be an essential and well-adopted tool for Maryland residents. More than 2,700 neighborhoods across Maryland are using Nextdoor to stay connected. Maryland residents can create private neighborhood websites to share information, including neighborhood public safety issues, community events and activities, local services, and even lost pets with Nextdoor. MEMA will be able to post information, such as important news, preparedness information, and emergency notifications to communities across Maryland. Nextdoor is free for residents. Each Maryland neighborhood has its own private Nextdoor neighborhood website, accessible only to verified residents of that neighborhood. Neighborhoods establish and self-manage their own website and MEMA will not be able to access residents’ websites, contact information, or content. All members must verify that they live within the neighborhood before joining. Information shared on Nextdoor is password protected and cannot be accessed by Google or other search engines. Residents interested in joining their neighborhood’s Nextdoor website can visit www.nextdoor.com and enter their address. Maryland preparedness information can be accessed on the Maryland Emergency Management Agency’s website at mema.maryland.gov. You can also view the video of today’s announcement on MEMA’s Facebook Page at www.facebook.com/MDMEMA.